268 pages | 18 B/W Illus. 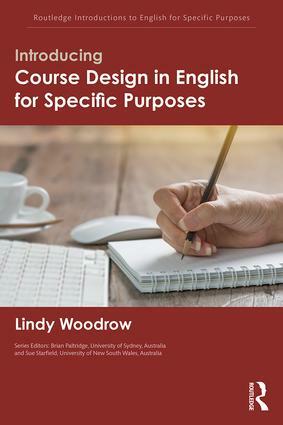 Introducing Course Design in English for Specific Purposes is essential reading for pre-service and in-service teachers, and students studying ESP and applied linguistics. Lindy Woodrow is Honorary Senior Lecturer at the University of Sydney, Australia. Routledge Introductions to English for Specific Purposes provide a comprehensive and contemporary overview of various topics within the area of English for specific purposes, written by leading academics in the field. Aimed at postgraduate students in applied linguistics, English language teaching and TESOL, as well as pre- and in-service teachers, these books outline the issues that are central to understanding and teaching English for specific purposes, and provide examples of innovative classroom tasks and techniques for teachers to draw on in their professional practice.